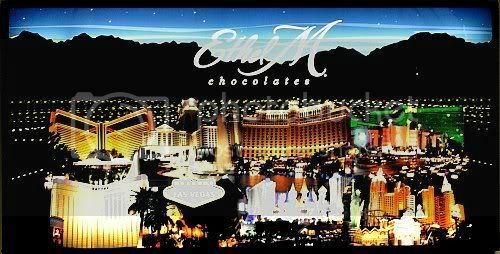 Most everyone is familiar with the bright lights of Las Vegas, and many know of Ethel M Chocolates, the exclusive chocolatier of the Mars family and M&M's. Some may even know of their Henderson, NV factory self tour and their cactus gardens with a unique collection of desert plant life from around the world. As I've posted before, this time of year brings out another kind of treat, the holiday lighting of the gardens, with this year's display said to be over 750,000 lights. Celebrities were on hand once again for the grand opening this annual Las Vegas community event. Our now native Las Vegan 'chocolate man' as he puts it, comedian George Wallace was back as host, and Monte Carlo headliners Zowie Bowie and entertainer Michael Grimm performed. This was in addition to local school groups, and several will be caroling through the season. Not to worry if you missed the opening, it's still something to see. It's lighted from 5 - 10 PM every day through Jan. 1, only closing for Christmas Day. Of course you can walk through the factory and check out some of their chocolate sculptures, and even get a free sample of their fine chocolate. You can also purchase their candies in the factory store, it's pretty hard to resist. A personal suggestion is to stop at the counter for a hot chocolate for your stroll though the lights. There's just something about their rich chocolate combined with the marshmallow and whipped creams that makes your walk all the more enjoyable. For those that can't make the trip, or those that will but would like a preview of coming attractions, I'll offer 3 different ways to check out the display. The first in a Photoshow with holiday backgrounds and music. To watch full screen, instead of using PLAY, click the HD or Full Screen button on the bottom of the player below, and when finished click it again or use the ESC key to return. The XML Flash player NOT embedded in your current posting location? Click here to view these pictures , and the pictures can also be downloaded on the right side of that page. Or for all my Las Vegas Photoshows that include some of the interesting neighborhoods and other community activities found in and around the Las Vegas Valley, CLICK HERE. For larger and more crisp images, but without sound, you can check the slideshow out at my Picasa Album. This is the small version. You can find the full window slideshow by CLICKING HERE. These pictures and others of the Las Vegas area are also available as higher quality large images that are downloadable in my Picasa Photo Album. They are under a creative commons, so you can have them for personal use, like a wallpaper. For any commercial uses, just get in touch. One of my night images of City Center was used for the International Structural Engineering and Construction Conference hosted by UNLV in September 2009, so permissions are possible if you ask. Last but not least, I give you my Youtube video of a walk through part of the gardens. It gives you an even better idea of the incredible and unique holiday lighting display. This is set to TSO's Christmas Cannon Rock, which seemed appropriate with their concert's popularity here in Las Vegas. Due to previous sellouts, this year they'll be offering 2 shows on Dec. 5 at the Orleans Arena. It's another great holiday family event we get to enjoy. This holiday display is one of several to be found in the valley. It's one of the many unique community events, that combined with all the offerings found under the bright lights of the Las Vegas Strip, makes Las Vegas such a great place to call home. If you are interested in relocating to Las Vegasor would like more information on Las Vegas real estate, please email me, Roberta LaRocca, at roberta@search4lasvegashomes.com, or call 702-354-8988. I look forward to hearing from you!